105 / 30, Ghagare Residency, Lane No. 14, Prabhat Road, Near Income Tax Office, Beside Sakas Food Products, Erandwane, Pune - 411004, Maharastra, India. 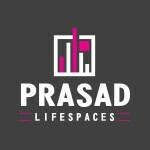 Prasad Lifespaces LLP is a leading player in pune real estate industry. Everyone dreams to have our own home & we help many of them to make their dreams come true. We build each home painstakingly, with focus on Quality, Useful detailing & ensure Value for money. They desire to earn people's trust and confidence while they create whenever they launch their new product and services.